Ekstraklasa Live Park, host broadcaster for Polish premier football league Ekstraklasa adds a new UHD/4K/HDR OB Van to their fleet. 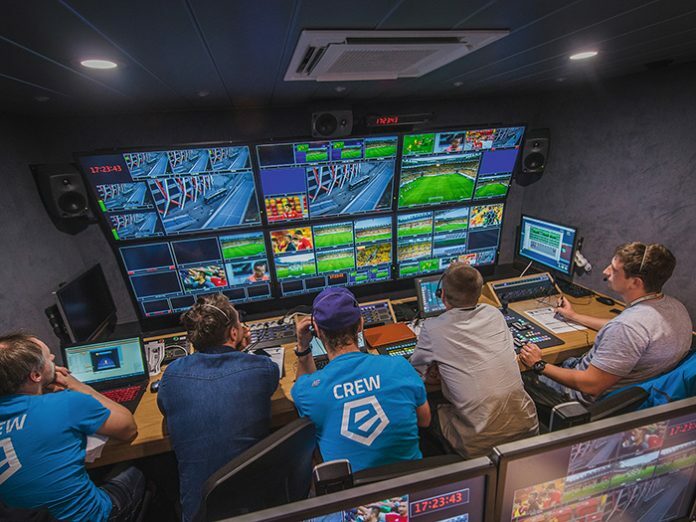 Set to produce matches from the beginning of 2019, the OB Van is designed and built by system integrator Broadcast Solutions with partners NEP. The new truck is the second unit delivered by Broadcast Solutions, after initial delivery of a Streamline S12 HD OB Van in 2015. The OB Van leverages the latest technology to ensure for a seamless and simultaneous SDR/HDR and HD/UHD production workflow. To advance productions for HDR content Grass Valley’s LDX 86N 4K cameras are upgraded with perpetual HDR licenses. For conversion and HDR-processing, Live Park and Broadcast Solutions opted for AJA solutions, Ten FS-HDR units handle HDR remapping and SDR conversion. For audio and video processing Broadcast Solutions implemented Riedel’s MediorNet solution, based on MetroN Core Routers, MicroN I/Os and MicroN multiviewer devices, as a decentralised signal routing and distribution backbone. Further on the unit is equipped with EVS’ newest live production server generation XT-VIA plus LSM Connect and XFile3, the fully networked EVS eco-system enables multisite and collaborative workflows. With its external stage boxes, equipped with Riedel MicroNs, Lawo I/Os and DirectOut bridging devices the new OB Van is ready for the most demanding production purposes.